Studio Bell. Winner of Architecture Award and Steel Edge Award. Photo: Jeremy Bittermann. 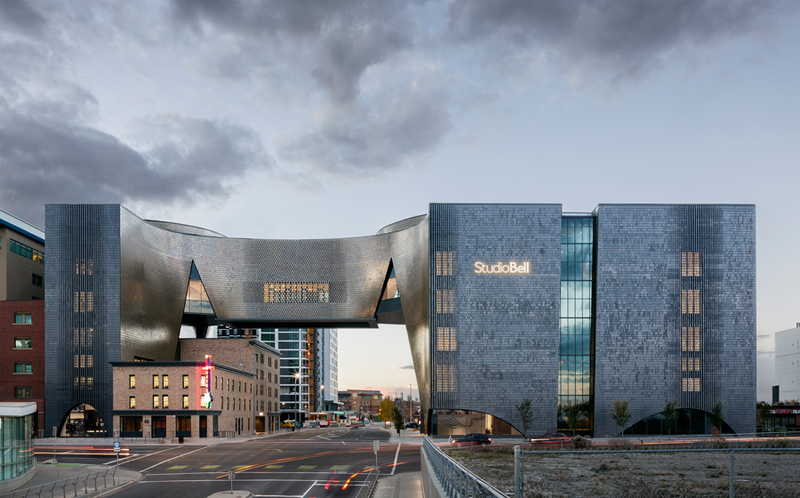 The Canadian Institute of Steel Construction has announced the winners of the 2017 Alberta Steel Design Awards, celebrating exceptional steel projects in six categories including architecture, engineering, sustainability and more. CISC Fabricator/ CISC Detailer: Canam Group Inc.
CISC Erector: Walters Group Inc.
An award for a project team who demonstrates “value added” to the project through collaborative project delivery approaches throughout the design and/or construction process. CISC Fabricator/ CISC Detailer/ CISC Erector: Walters Group Inc.
General Contractor: CANA Management Inc.
Steel Edge Award: An open category demonstrating excellence in the application of steel design, fabrication, detailing or finishing. These projects demonstrate tremendous ingenuity in addressing unique design, resource or application challenges. CISC Fabricator: Sturo Métal Inc.
Steel structures created as part of a community development project with a focus on serving community needs. This includes, but is not limited to, municipal government projects, not for profit companies, art installations and other installations (all building types, bridges, and structures). Projects that impact and enhance the community around them will be considered. Steel structure in which steel has been used or re-used as part of a sustainable development project that aims to improve environmental impact of the structure by using innovative practices, standards and technologies.